Spring is in full bloom and Easter is right around the corner. As employees look ahead to vacations and summer fun, workplace productivity can diminish. Managers and supervisors want productivity to remain high throughout the year, but it can be hard to motivate personnel about work when outside activities are beckoning. That’s why it is important to have a solid performance improvement plan in place. Having an employee motivation program keeps your workforce focused on the prize. A concerted approach to creating and implementing a workforce program can keep employees, supervisors, management, and customers happy. Discussion sessions: Have supervisors schedule regular team discussion sessions. These can be short and to the point, but the object is to take a break and think about things differently. Don’t focus on shortcomings or company regulations. Subjects should cover positive work topics such as what went well this week, ideas to try to make work flow more efficiently, or helpful customer insights. Stave off boredom: Whether working in a cubicle from 9-5, or doing repetitive assembly line tasks all day, work can become drudgery. Variety is the spice of life, so find unique ways to inject a little fun into the day for a few minutes and the rest of the time will be more productive. Recognize achievements and milestones: Take some time to recognize your team. Acknowledge members in your organization for their contributions and accomplishments. Doing so boosts pride and lets your workforce know their dedication is valued. Inject something new: People like to be part of the bigger picture. Allow employees to cross-train, provide information about open positions, or rotate opportunities to shadow a supervisor for a shift to see how things look from the other side. A strong change management plan coupled with an employee recognition program will increase productivity and keep the summer doldrums away. 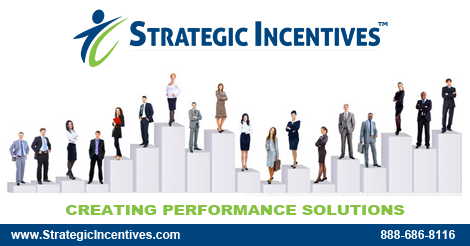 Visit our web site at https://www.strategicincentives.com to download a complimentary copy of “35 Smart Ways to Use Incentive Programs.” Call 888-686-8116 now for more information on improving workplace productivity and take advantage of our special offer for April. Happy Spring and Happy Easter from Strategic Incentives!